to Nan Smith about game farming and the golden wildebeest. A quick visual appraisal of these wildebeest would favour the animal on the left, although this may be because he was born earlier in the calving season than the other two bulls. Barry York is a warm, tough, hard-working bear of a man. An ex-Zimbabwean, who sees himself as a naturalised South African, Barry has faced the challenges in his life with tenacity and courage, and succeeded in the difficult world of game farming. His easy manner masks a shrewd intelligence that anyone meeting him would be ill-advised to ignore. The York family is based at Sandstone Valley farm (1 020ha) in the Alma district of the Waterberg. They have a second farm near Thabazimbi, which is run by Barry’s son Chris (36). The Waterberg, a place of spectacular scenery, is an area in northern Limpopo where game ranchers are becoming efficient at turning their farms into successful businesses by diversifying into breeding game. The core business of these ranches has always been hunting and eco-tourism, but breeding game, specifically breeding what these game farmers call ‘rare’ species, has proved to be much more than a sideline. 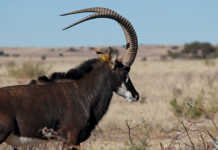 The high-value species include disease-free African buffalo (Syncerus caffer) roan antelope (Hippotragus equinus), sable antelope (Hippotragus niger) and colour variants of the blue wildebeest (Connochaetes taurinus), the impala (Aepyceros melampus), the blesbok (Damaliscus dorcas phillipsi) and the eland (Taurotragus oryx). There is always an advantage to being ahead of the wave in business, perhaps especially so in farming. Breeding game species whose numbers are on the decline, and especially those animals in demand by hunters, is now an industry in full swing. It was not always so. A hunter ultimately shot the animal. “I was devastated that such a beautiful animal had been shot,” says Barry. Captivated by the elusive colour variants, he kept searching for them. In 1992, after capturing a golden wildebeest bull, Barry and pioneer game capture specialist Alec Rough started a breeding project. After three to four years of experimentation the partnership got their first golden calves when they put a golden bull to the F1 offspring (the heterozygous crosses). “There was virtually no commercial value to them at that stage. A well-known game farmer offered me just R5 000 for a bull,” says Barry. Financially the picture has changed considerably since then and golden wildebeest bulls have sold on game auctions during the past two seasons for up to R1,4 million each. “When Nature Conservation lifted the ban on colour variants a few years ago, prices rose immediately,” recalls Barry. A quick scan of the internet brings up an American hunting outfit, African Hunt Lodge, that is offering clients the opportunity to hunt a trophy golden wildebeest in Limpopo for US$95 000 (R937 000), excluding the daily rate. It looks as if Barry’s vision is paying off. 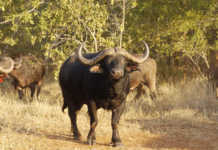 The Yorks settled in the Waterberg in 2007. Soon after Barry met Bernard Groenewald (35), an astute and driven young businessman, with whom he formed an association they named Golden Breeders. Bernard, born and raised in Modimolle, has a farming background and is as passionate about the golden wildebeest as Barry is. 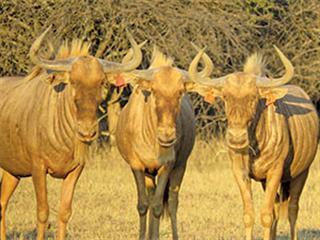 Their association has created the country’s largest golden wildebeest breeding project. They have bred enough golden wildebeest bulls to run a veld bull test, which is probably the first of its kind in the game business. A group of 30 young golden wildebeest bulls born in the December/January 2011/2012 season are run on a 100ha of veld divided into two 50ha camps. One camp is rested while the other is grazed. The animals are supplemented with a standard ration of antelope cubes at a flat rate of 2kg/day year-round. Questioned about rotation methods Barry says: “We rotate the animals from one camp to another by moving the food and water. Wildebeest are extremely well-adapted and are quick learners, adjusting readily to the human element. 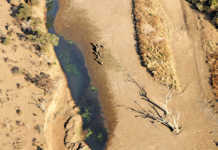 The test is run in veld classified as sandy bushveld and the area has an average annual rainfall of 520mm to 650mm. Maximum summer temperatures rise to 35°C and frost occurs in June, July and August. The test camp adjoins the Castle de Wildt game sale and conference facility that belongs to LBG Holdings, Bernard’s family business. These animals will ultimately be sold to other breeders, ensuring that the best possible golden wildebeest genes make it into the breeding arena. The limit on minimum measurement for a Rowland Ward trophy animal is 28” which measures the greatest spread at the outer limits of the horns. Golden Breeders’ top bull of the 2011 season, King Louis, measured a 28” horn spread at 22 months. King Louis has been put to a group of heifers during the past breeding season. The heifers in calf are to go on sale at the Castle de Wildt auction on 13 July. “Game breeders will have the opportunity of buying the very best genetics we have available,” says Barry. Veld testing can provide historical data that can be used in DNA typing and building up a genome. Genomics is an advanced and developing science that will allow ranchers and scientists to fast-track selection for advantageous traits. The golden wildebeest is a colour morph of the blue wildebeest (C. taurinus). The golden hide is an expression of a recessive gene that must occur in both parents. Wildebeest with a standard phenotype but a heterozygous genotype (thus carriers of the gene) are referred to as ‘splits’ in the industry. In the absence of a DNA test, the only way to ensure the presence of ‘splits’ is to remove the homozygous dominant males from the group. Homozygous recessive animals will always express the golden colour in the phenotype. Stud cattle farmers have access to records and EBVs to help them make informed decisions. Game farmers have no such history but if the industry is to change and game is to be farmed to ensure a sustainable supply for tourism and hunting, inevitably marketing and animal quality will play a role. As cattle farmers select for economically strong traits so will game farmers. Both groups are working towards making their products more marketable to consumers whether they are trophy hunters, meat eaters or milk drinkers.